Join us for our monthly featured author/open mike series that happens every 4th Tuesday of the month. This month we are Honoring Mary Oliver. To celebrate the life and work of much loved poet Mary Oliver, Liza Hyatt, monthly host of Poet’s Laureate of Lawrence, will share a selection of favorite Oliver poems. In the open mic portion of this evening, all attending are invited to share their favorite Oliver poem, or poems inspired by and responding to her. Adrien Matejka is a National Book Award and Pulitzer Prize-nominated poet who teaches at Indiana University Bloomington and is Poet Laureate of Indiana. His most recent book is Map to the Stars (Penguin, 2017). Thursday, March 28, at 7pm in the Damenverein Room of the Athenaeum. Come join us as IUPUI students and community members perform their original poetry, short stories, essays, and songs. Meet fellow writers and artists and join in audience participation games to win fun prizes. Step up to the mic and share your own creative works. 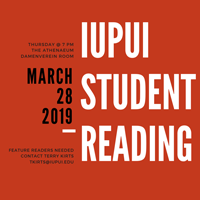 Established in 1999, the IUPUI Student Readings are sponsored by IUPUI's Creative Writing Program and are free and open to all. Please contact us at least one week before each reading to be a featured reader. Open-mic spaces are limited and cannot be guaranteed on the night of the reading. Contact Terry Kirts to be a featured reader at tkirts@iu.edu. Thursday, March 28, 2019, 7:30 p.m.
Robert M. Edsel is the #1 New York Times best-selling author of the non-fiction books, Rescuing Da Vinci, The Monuments Men and Saving Italy. His current books are available from Amazon or from the author. Alex Chambers is the author of Bindings, a collection of poems forthcoming this summer from Pickpocket Books. His radio stories appear on Earth Eats, out of WFIU, and his poems and essays in Gulf Coast,Forklift, Ohio, and elsewhere. He teaches American Studies and breadbaking. LuAnne Holladay writes poetry — and other stuff — to help her make sense of the wonder and worry of the world. She tries to pay attention to things, and writing helps her do that. 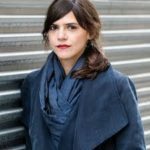 Valeria Luiselli is an award-winning Mexican novelist and nonfiction writer. She will present a public reading and give a talk, as part of IU’s Mexico Remixed series. In excerpts from Kurt Vonnegut's works, we get to know the mind of his alter ego, Kilgore Trout, the greatest science fiction author who never lived! This event is hosted by InConJunction, the local fan-run sci-fi and fantasy convention (July 5-7), presented by the Circle of Janus SF/F fan club for the 39th year. The convention regularly donates to literacy causes, including to Indy Reads Books in recent years. This year's beneficiaries are Indy Reads and the Kurt Vonnegut Museum and Library. 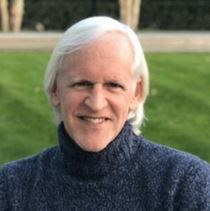 John L. Belden, 2019 convention chair, will host the reading. Twelve outstanding Indiana poets will share their work with audiences at the Indianapolis Artsgarden on four Mondays in April in honor of National Poetry Month. Presenting Kevin Mckelvey reading from his book "Wilderness Dream Poems"
Kevin McKelvey is a place-based writer, poet, designer, and social practice artist. His poetry book, Dream Wilderness, was published last year, and another book, Indiana Nocturnes, written with Curtis Crisler, will be published this year. He is at work on a novel and regularly completes workshops, art installations, and placemaking projects around Indiana. At the University of Indianapolis, he serves as Associate Professor in the English Department and as director of the university's Masters in Social Practice of Art program. McKelvey grew up on the edge of a cornfield near Lebanon, Indiana, and attended DePauw University and Southern Illinois University Carbondale. Visiting Writers Reading Series with Tommy Orange reading from his fiction. Join the Writers of Central Florida or Thereabouts as they continue their award-winning - and losing - literary Open Mic series in Evansville, Indiana for writers, authors, storytellers, poets, filmmakers, musicians, bloggers, and aspiring circus clowns. Please, no mimes. A sign-up sheet is available when you walk in starting at 7:00 PM. Or you can simply sit back and enjoy the evening. Coffee will be available.